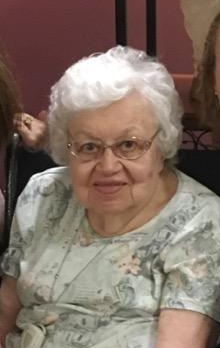 Obituary for Rosemarie (Zamiska) Mondell | Thomas J. Gmiter Funeral Home, Inc.
Age 86, of the South Side, passed away peacefully on Monday, December 3, 2018. Loving wife of the late John E. Mondell; daughter of the late Joseph A. and Mary (Grega) Zamiska; sister of Veronica (Cliff) Moeller, Mary Ann Matey (Brian Kovaly), Joann (Alan) Chelkis and the late Charles "Carl" Zamiska; sister-in-law of Bernadette Jakicic; also numerous nieces, nephews, great nieces and nephews and great-great-nieces and nephews. She was a former choir member of St. Matthew's Church, member of the Slovak Catholic Sokol and the Jednota. Friends received Wednesday 6-8 PM and Thursday 12-8 PM in Thomas J. Gmiter Funeral Home, Inc. 2323 E. Carson St. Funeral Prayer Friday 9:00 AM, Mass of Christian Burial in St. Adalbert Church, Prince of Peace Parish at 10:00 AM. She will be dearly missed by all.